Most folks don't know the true pleasure of fishing. It's not just catching the fish, it's the enjoyment of all that surrounds that endeavor. The elements of nature including weather, birds, botany and wildlife all play a significant role in taking in an entirely fulfilling experience. Of course, if you can add an element of companionship with someone that enjoys this activity, well as George says, "It just don't get any better than this". Fishing is not a matter of life or death . . . . It’s way more important than that! Fishing is not only about going to Canada, which we try to do annually. It's about catching and releasing really nice fighting Channel Catfish here at home. Primarily we take the old Pontoon boat out early in the morning or late evenings for a chance to give exercise to these beauties that dwell in Hoover Reservoir in Columbus, OH. 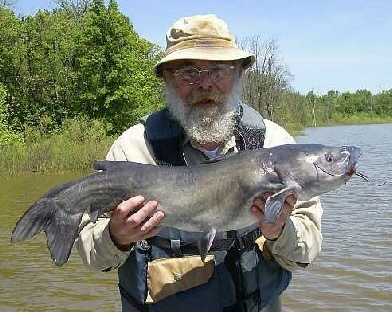 Here's examples of Fish Ohio Cats that were caught, kissed and released during the season. 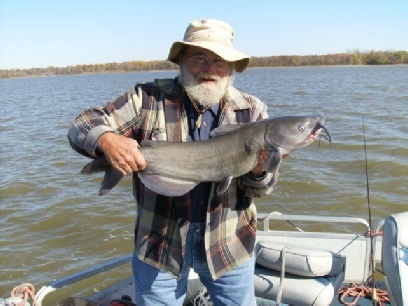 To learn more of the techniques we use, see the link below for "Reservoir Fishing For Channel Catfish ".